Now that Obama is the presumptive Democratic nominee, Clinton supporters are understandably disappointed, but the complaints of some are just annoying. I agree that Hillary was the victim of many undeserved sexist attacks. I would much prefer focusing on the issues rather than stupid crap like pantsuits and cleavage. I’m sure that there are some people who didn’t vote for her simply because of her gender, just as some didn’t vote for Obama because of his race. I don’t think that’s why she lost, but it IS an undeniable fact, and a serious problem with our national political discourse. Now that Hillary is (presumably) out of the race, though, where do you think that misogyny will be focused next? Yes, that’s right. Michelle Obama. For three years after law school, Michelle worked as an associate in the area of marketing and intellectual property at Chicago law firm Sidley and Austin, where she met Barack Obama. She left the corporate law world in 1991 to pursue a career in public service, serving as an assistant to the mayor and then as the assistant commissioner of planning and development for the City of Chicago. In 1993, she became the founding executive director of Public Allies – Chicago, a leadership training program that received AmeriCorps National Service funding and helped young adults develop skills for future careers in the public sector. 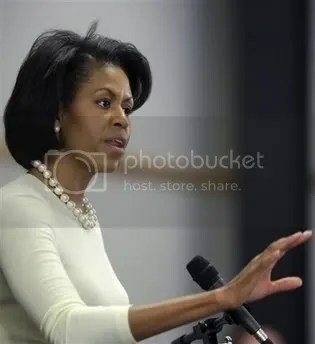 Michelle began her involvement with the University of Chicago in 1996. As associate dean of student services, she developed the University’s first community service program. Michelle also served as executive director of community and external affairs until 2005, when she was appointed vice president of community and external affairs at the University of Chicago Medical Center. She also managed the business diversity program. Michelle has fostered the University of Chicago’s relationship with the surrounding community and developed the diversity program, making them both integral parts of the Medical Center’s mission. What an impressive list of accomplishments. If it’s really about empowering women, then Hillary’s feminist supporters should get behind Michelle, right? Right? Yes, Michelle is getting the love today, but this clip in particular talks about something that’s close to my heart: public education. Yes, to me Michelle Obama represents the American Dream, the one I envisioned as I was growing up during the Civil Rights Movement. I also come from a working class family. I went to public school in NYC, and that public education was sufficient for me to go to college and eventually get a PhD. Yet this path is closed to my niece and nephew in the current economic and political environment. I support Obama because I want the next generation to have the same opportunities that I had. Who better to do that than someone who experienced it for themselves? Michelle Obama on The Colbert Report (h/t Jack and Jill Politics). What a great First Lady she’ll be!